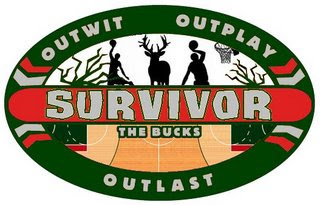 Bucks Survivor: Round Eight ~ The Bucky Channel - The World of Sports from Wisconsin's Perspective. When we got to this point in the contest, I figured that the battles would be come a little more tighter and that each round would bring some drama to it. But it seems instead that there is a very distinct order in just how valuable each individual Bucks player is to this team. Last week, Jerry Stackhouse was kicked off overwhelmingly, and this week, it wasn't close at all, again. With 67% of the vote, it's time to say goodbye to Luke Ridnour. That leaves us with six Bucks to go, and by the looks of things it may be Carlos Delfino's time to exit, as he was second in voting last week with 17 percent of the vote. It's down to him, John Salmons, Andrew Bogut, Luc Richard Mbah a Moute, Brandon Jennings, and Ersan Ilyasova. Basically the question this week becomes not who should be eliminated from the contest, but which of these six guys is the best choice for the sixth man? Voting will start a bit later than normal, but it will still commence at it's normal time of Friday night at 6pm. Again, vote for which Buck you want to eliminate at the top right of this blog.